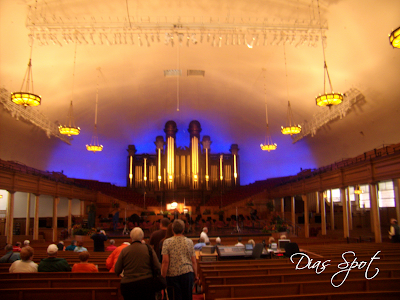 Photos were taken inside the Mormon Tabernacle in Salt Lake City, Utah. This was taken last year during our visit to Salt Lake City. The place is very solemn and the structure is phenomenal. The Salt Lake Tabernacle, also known as the Mormon Tabernacle, is located in Temple Square in Salt Lake City, Utah along with the Salt Lake Assembly Hall and Salt Lake Temple. The Tabernacle was built to house meetings for The Church of Jesus Christ of Latter-day Saints (LDS or Mormon church), and was the location of the semi-annual LDS General Conference for 132 years. However, because of the growth in the number of conference attendees, the LDS General Conference was moved to the new and larger LDS Conference Center in 2000. In the October 1999 General Conference, LDS Church President Gordon B. Hinckley gave a talk honoring the Tabernacle and introducing the new LDS Conference Center. Now a historic building in Temple Square, the Salt Lake Tabernacle is still used for overflow crowds during General Conference. 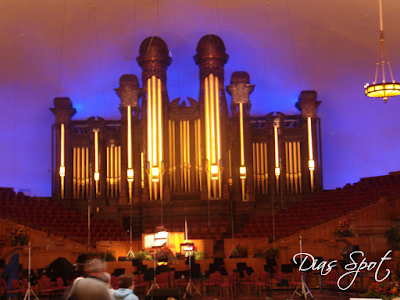 The Tabernacle is the home of the world-renowned Mormon Tabernacle Choir, and was the previous home of the Utah Symphony Orchestra until the construction of Abravanel Hall.